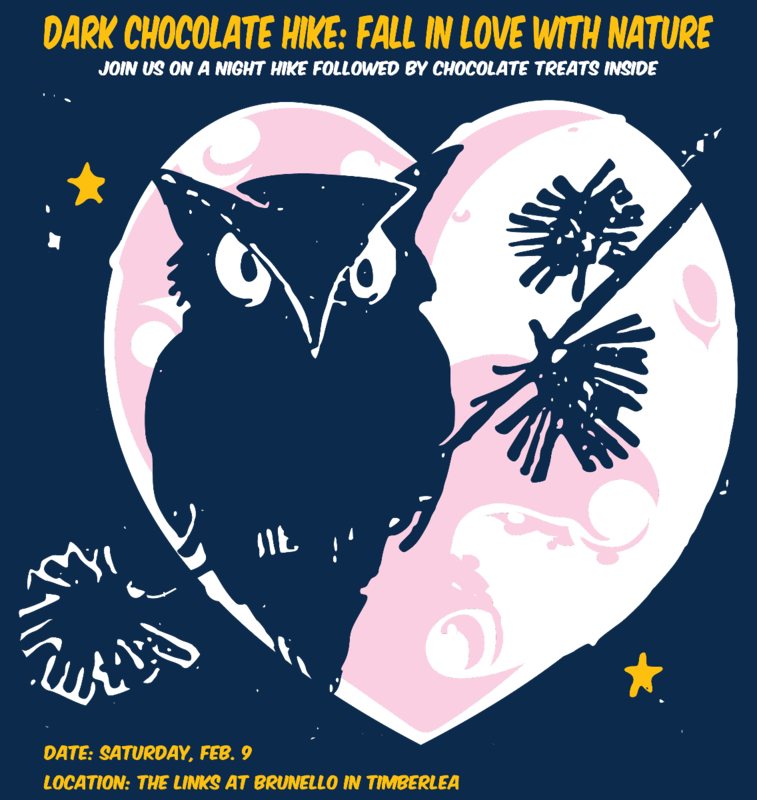 Show your love for nature by joining us for a guided family or adult night hike with owl and astronomy experts. Snowshoes will be available to borrow depending on weather and delicious post-hike treats will include hot chocolate, chocolate treats and wine for adults. There will prize draws as well! Proceeds will go to support the great programming both Hike NS and the Young Naturalists Club provide getting Nova Scotians, outdoors, active and exploring nature. Event will proceed no matter the weather (unless driving conditions are unsafe), so dress for the weather (layers and waterproof outerwear is best) and bring a headlamp. If there’s enough snow we’ll snowshoe, so bring your own snowshoes if you have them (if not, we’ll have some onsite for you to borrow). We thank The Links At Brunello and MEC for their support. Cancellation Policy: Refunds will be issued only up until 5 pm on February 4. No-shows will not be reimbursed. In the case of severe weather conditions, the event will be moved to February 10 (if that date is cancelled, all tickets will be reimbursed). You will be notified by email if the event will be moved to February 10.